The magic of photoshop. I can tell you 100% that only the low beam is HID. The highbeam is very much a simple halogen bulb. Finally got delivery of my S diesel. Doesn't she look smashing in red? . Holy damn! That red exterior + blackened effect looks smoking hot. You also got the best engine of the lineup. Congrats! Or you could just go to 3M and get a carbon-fibre wrap over it. Must say that the Ecosport is one car that has aged very gracefully. Infact, its a shocker when you realize that we have been seeing the car for almost seven years now - the first unveil was back in January 2012! Still is the class best when it comes to sub-4m compact SUVs. Congrats on the red hot beauty! I had shown him this thread before he bought his Ecosport and had asked him to check and confirm. It seems there are 557 owners who have complained to Ford regarding this bulge. It is scary for my BIL, as he bought top of the line Titanium+ variant at 13+ lakhs on road. He is really worried now, because in most cases, tyres are not covered under warranty. The solution is not to change the tyres, because as per the reports, the RIM design itself is the culprit. I think Ford must do a recall for new Ecosports and rectify this problem. Tell your BIL to raise this issue with the dealership and / or directly with Ford as they have been replacing all 17" tyres with this issue under warranty. The newer batch of tyres are supposed to have a stronger sidewall. He can actually push for all 5 tyre replacement since quite a few people have had this done (source: the Ecosquads fb group). My BIL bought a new Ecosport (facelifted) 6 months ago. Today he called me to inform that his Ecosport tyres have developed the dreaded bulge. That's why I HATE this new trend of oversized wheels and all the stupid manufacturers don't understand they are simply impractical for Indian conditions. - Replacement cost of tyres is higher. The newer batch of tyres are supposed to have a stronger sidewall. Stronger sidewall = firmer sidewall = even bumpier ride quality . He is really worried now, because in most cases, tyres are not covered under warranty. The solution is not to change the tyres, because as per the reports, the RIM design itself is the culprit. I think Ford must do a recall for new Ecosports and rectify this problem. It's not the rim design but rim (and tyre) size. Low profile tyres and oversize rims look good but the price you pay is tyre and rim damage on Indian roads. Low profile tyres are not ideal for our roads. I think TKM experienced the same with the new Innova Crysta and IIRC reduced rim size from 17" to 16" on some variants. A good move that Ford should follow. What possible options for future Ecosport owners to change the tyres after market? I am looking at the Ecosport S, but do not want a low profile tyre. What tyre spec can I change to in the 17" but with a higher profile? Not sure if this is the right thread. Have ford removed the storage box from underneath the left side front seats. Our ecoboost is missing this storage compartment. When checked with the dealer they said the newer models don’t have this feature. Can anyone confirm this please. Congrats to Vid6639, Anshuman & the Team-BHP team for a comprehensive & unbiased review. Rated 5 stars! I'm happy that I was able to help out in a small way. I enjoyed the drives and photoshoot with Vid6639. Yes, this has been a problem since the first day. 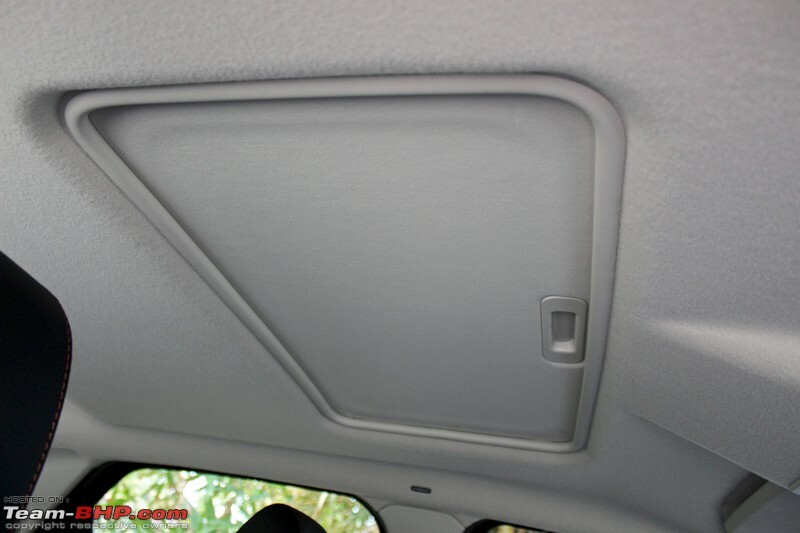 There is some play with the sunroof cover when its open & the vehicle is driven over almost any surface, which in turn causes this rattling sound. Within a week of purchase, I went to the JSP Ford service center at CK Payla (near Bannerghatta Road). While the service technician quickly acknowledged that there was a problem after a road test, the service manager (Tharesh) seemed least interested in solving the problem, despite the fact it was a brand new vehicle, top of the line variant. After making me wait an hour, he simply concluded that this is a generic problem with all Ford EcoSport vehicles with sunroof and that assistance from the Ford's technical team would be needed to sort this out. He told me to come back after some time. Needless to say, I left the service center with a bitter taste. Not exactly the Ford Service promise I expected! Later on, I visited the showroom where I purchased the vehicle, met my sales advisor and told him about my problem. We drove my vehicle, noted the rattling sound, and then drove the test drive variant with sunroof. We didn't observe any rattling sound. 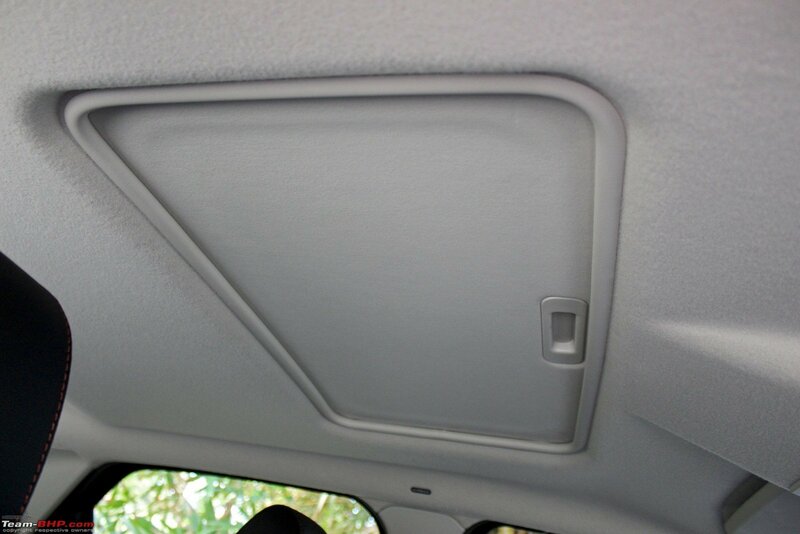 Now, this proved to me that this wasn't some generic problem with all Ford EcoSport vehicles with sunroof. I was sold a vehicle with a defective sunroof unit that the PDI did not pick up. I did do my own PDI before signing all the papers, but I wasn't allowed to test drive the vehicle. After raising a formal complaint with Ford customer support, a service technician visited my home and took audio & video recordings of the problem to share with Ford's technical team. Finally, they told me that a more detailed inspection is required and I had to visit the service center (again). Considering that the first service is due in a month's time, I decided to bear with this issue until then. I'm hoping this issue will be sorted out during the first service. Was impressed by the ability of Ford official customer care to get things moving along for me. I test drove the Ecosport S yesterday & really liked the car but 1 thing has been a big downer - very hard clutch! I also found the clutch hard when compared to my previous car. I had test driven other vehicles like the Maruti Vitara Breeza & Hyundai Creta, and their clutches were much lighter in comparison. However, I wouldn't call this a deal breaker as I've gotten used to it in a month's time. Coming to fuel economy, I've driven 1500kms so far, 95% of which is in city conditions, bumper traffic. The MID showed 8.7 kmpl initially and has now settled at 9.5 kmpl. It is yet to see double figures. I doubt it ever will though in city conditions. I must admit that I've been revving this motor a bit more recently after crossing the 1000 kms mark (credit to Vid6639 ) and absolutely loving the turbo kick. In city, I mostly stick to 2nd or 3rd gear and speed goes from 20kmph to 50kmph in seconds, makes overtaking a breezy affair. I rarely find myself in 4th, let alone 5th gear. Well if it helps, the TPMS seems more like a marketing gimmick to me. I've never found it to be accurate. The deviation is as high as 3 PSI (+/-) after filling my tyres. When I reported it to the service center, they told me that the deviation is within error parameters (+/- 3 PSI). As an end user, the TPMS is almost useless to me. I can accept a deviation of 1 PSI (+/-) but not more. Just imagine filling your tyres for 30 PSI and the TPMS shows 33 PSI instead. I guess the only useful thing is that the MID would show a warning when one of the tyres has a flat. The service technician also told me that they have got multiple complaints from customers about the inaccuracy of the TPMS, which is why they consciously dropped it from most of the variants in the lineup. Yup, excellent way to solve the problem! Last edited by Gannu_1 : 9th September 2018 at 21:38. Reason: Back to back posts merged. Please use the multi-quote option (QUOTE+) while quoting and responding to multiple posts. Thanks. or can we upgrade our existing insurance by opting for this too. I am changing my ride's shoes soon, with better specs this time, your answer would really help. It is an add-on, similar to Zero Depreciation. It is generally called, 'Tyre Secure' or something. I guess you will be able to add it to your existing insurance if your insurer offers this as an add-on. It only takes care of the tyres. The alloys are covered under normal insurance as far as i know. The amount of money that the insurer will compensate in case of damage depends on the tread depth of the tyre. In short, the more the tyre is used, the less will be the money of the new replacement tyre that the insurer will pay. Is this so? I have found the readings to be accurate on a friend's Titanium+ AT with TPMS and my recently delivered S. My reference here is a Michelin tyre pressure reader I have and not the local tyre guys who's gauges are almost always not properly calibrated. My TPMS is accurate to 1 psi. Basically the system warns the driver in the event of loss of pressure in any tyre. This has been mandatory in the US for many years. This feature was one of the first to be removed and IIRC it happened when they removed Sync from Titanium and below. Titanium+ lost the tray.